In this post, I want to show you how to: Create an App Service on Linux on Azure, set up a build pipeline on Azure DevOps (previously known as VSTS), and integrate Azure DevOps with Sentry. 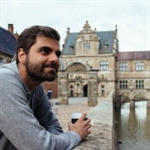 Joao Grassi — a .NET developer, front-end hobbyist, and friend of Sentry — likes .NET very much and recently tried to bring a friend to the "dark side" of .NET development. To win a point, he decided to create a small sample project using Azure DevOps. As he started, he struggled to find helpful information in the documentation (like how to control the artifact name). As he finished the project, he wondered: Wouldn’t be nice to have this somewhere to save the hassle of Googling everything again? There’s no doubt that Cloud development is becoming more and more popular, and for many, the de facto way of building, deploying, and hosting apps on the web. But many of us still work on our daily jobs in a cloud-less environment due to reasons that are not relevant to this post. There’s really no excuse when it comes to avoiding cloud development and taking advantage of all the good things you can get from it. One specific benefit is the ability to configure a build pipeline that builds the project, ensures everything is compiling, and checks to see that tests are passing. Build pipelines also produce Artifacts, or .zip files containing the code for your application, that allow you to publish your app on Azure or other cloud services. Create an App Service on Linux on Azure. Set up a build pipeline on Azure DevOps (previously known as VSTS). Integrate Azure DevOps with Sentry. An account on Azure DevOps within an organization: Just follow the steps here. A git repo on Azure DevOps for your project: here and here. The actual code — An ASP.NET Core API up and running (the simplest initial template (ValuesController), either via VS or command line). Log into your Azure portal (after creating your free account). Navigate to: Pipelines → + New → New build pipeline. On the next page you need to select the source for the build, which in our case is Azure Repos Git. But as you can see you can connect to other Git providers like GitHub. Select your project and repository (it’s probably already pre-selected) and hit Continue. On the "Select a template" page, select ASP.NET Core and hit Apply (you can also search for it). We don’t have to do a restore since .NET Core 2.0, but, in CI builds like this, it’s nice to have it separated because we can measure how much time each step took. Make sure to select the .NET Core version to 2. * The only thing we are going to change here is the Path to project(s). By default it tries to restore all the projects. In our simple API, we just need to restore the Api project. In the Path to project(s) field, click on the link icon next to it and then on Unlink. This will enable us to change the field. Now it does a restore for the API project, and if the API has dependencies to other projects in the solution, it will restore for those as well. In the Build step we will change 3 things: the Path to project(s), the Arguments and the Working Directory. Click again in the link icon next to Path to project(s) and point it to the .csproj of your API again like in the restore step. You are not required to have this structure, but I think it works nicely and it’s well organized. For instance, I like to put all my test projects under a test folder in the same hierarchy as the src folder. In the Test step, I specify the projects I want to test. A big solution often has multiple projects, and you probably also have separate builds for each of them. In this case, it makes more sense to specify each test project to run. The -c command will tell Azure DevOps to use the BuildConfiguration variable. By default the variable is set to release, but you can change it in Variables tab on this page. The -o argument specifies the location of the publish output. In my example, I specified it to publish into the pre-defined Build.StagingDirectory available in Azure DevOps plus into the ci-build folder. If you don’t specify the ci-build folder, it will create a folder for it. And, of course since we have built the project already, no need to do it again. So, skip the --no-build. I also unchecked the Zip Published Projects and Add project name to publish path. We’ll create our own zip in the next step. Expand again the Advanced menu and set the Working folder again as we did in the Build step. Now that we have the outputs from our dotnet publish command, we need to archive it. Click on the + button near Phase 1. Select the Archive Files option. You can search for it if not visible. Choose a name for the step, e.g., Archive Publish Output. I don’t want to prepend the root folder name in the zip, since I’d like my files to be at the root. So I unchecked the Prepend root folder name to archive paths checkbox. In the Archive file to create is where we configure the name of the zip artifact. I changed mine to: $(Build.ArtifactStagingDirectory)/starwars-api.$(Build.BuildNumber).zip. Make sure also to mark the Replace existing archive just in case. This step grabs the files produced from the publish step available in $(Build.StagingDirectory)/ci-build and zips them with a name consisted of starwars-api.buildnumber.zip. I used the Build.BuildNumber variable exposed by Azure DevOps to construct that name. Note that I also hard-coded the starwars-api part, but you can also set a variable for that, or use one of the many predefined ones, like the build name for instance. Change the Path to publish to: $(Build.ArtifactStagingDirectory)/starwars-api.$(Build.BuildNumber).zip. This will publish our zip to that location. Leave the rest with default values. That’s it for the build part! Now you can go to Pipelines → Builds → Queue, wait for it to finish and you should have a nice artifact. Now that your build pipeline is set up on Azure DevOps, you can integrate with Sentry unlock enhanced release tracking, informative deploy emails, and assignee suggestions for new errors. If you have the legacy VSTS integration installed, you’ll see a button next to Azure DevOps that says Upgrade. If you do not have the legacy VSTS integration installed, you’ll see a button that says Install. Click this button. In the resulting modal, click Add Installation. An Azure DevOps install window should pop up. Select the Azure DevOps account you’d like to link with Sentry, and press Submit. Read more about the features of this integration here, and learn how to configure those features here. You can also check out Joao’s original post, ping him with your questions, and read about his other adventures in .NET on his blog. Bruno Garcia is a software engineer based in Vienna, Austria. He is currently a developer at Sentry.io, where he builds and maintains platform SDKs, including support for .NET and C#. He is a speaker and writer on .NET Core, .NET Framework, and Mono as well as open-source technologies. He was previously a software architect at Greentube, Assistant VP at Barclays in the ABSA Group, and a Senior Software Engineer at Monster.